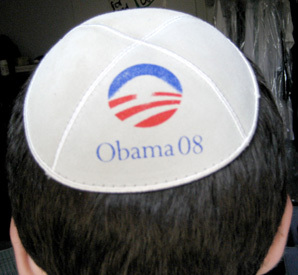 Our Save Darfur Yarmulkes helped to inspire a campaign strategy for Barack Obama’s presidential campaign in both 2007 and 2011. How? The story is simple: the Save Darfur yarmulke campaign proved so effective and original that Obama campaign managers decided to tap into the same audience in an unprecedented political move: Obamakas. 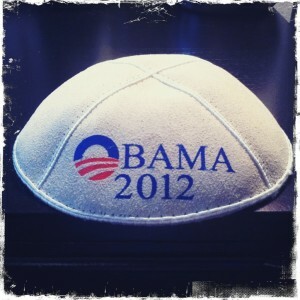 The Barack Obama yarmulkes are based entirely on Save Darfur yarmulkes. They have given a little credit to Robert Goodis Charities and the Save Darfur Yarumlke campaign along the way, but no reports have really set the record straight. Bloggers still speculate on the origins of the Obamaka. Hi. This is Josh from AJWS. I’ve actually recently left AJWS, but wanted to ask you a question. Can you tell me [about] the Save Darfur kippot …? I am volunteering with the Barack Obama campaign doing Jewish outreach and I suggested that they make up Barack Obama kippot like you did for Darfur. …. Of course, we may never know what kind of effect Obamakas had on voters or voter turnout, but it’s exciting to think that some of the ideas started by Robert Goodis—which ultimately led to his founding The Goodis Center—have caught on and been taken up by other grassroots campaigns and gained some attention in the press. Politico referred to them as Obamulkes in a short post when the trend re-emerged in the 2012 election season. The Goodis Center was not involved in any way with the Obama Campaign—or the Obamaka campaign—and does not endorse candidates for public office. The information about Obamakas is provided here to show how one of our fundraisers inspired other grassroots campaigns and helped to promote political discussion beyond our own audience.